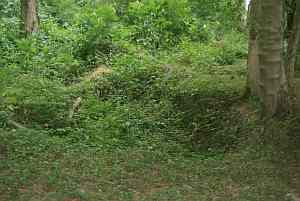 As part of the 53rd Division ,The 10th Essex and the 8th Berkshires fought all day on 27 August 1918 and recaptured Trones Wood after some intense fighting in which 17 men were killed and 35 wounded. Their Corps Commander remarked " This exploit reflects the highest credit on all concerned in its planning and execution". A few days after the capture of the wood two memorials were erected in memory of those members of the 18th Division who had died, not only in Trones Wood but in the campaign. The memorial to the south west was a large oak cross which stood in place for 8 years before it was brought back to Warley Barracks by Lt Colonel P Churchill and erected in a prominent position by the Chapel. 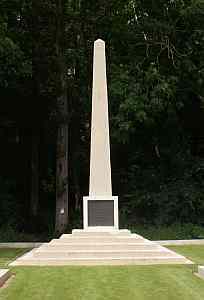 The memorial in the South East of the wood was made from concrete captured from the Germans on that exact spot.